My first two-page street panorama in London! Click on the image to see it in closer detail. This is the intersection of Berwick Street and Broadwick Street, looking down towards Wardour Street in Soho, the heart of London. I have loved Soho since I was a teenager, all its narrow, slightly grimy streets, alleys and shortcuts. I love sketching down there, in this neighbourhood between the Big Streets. 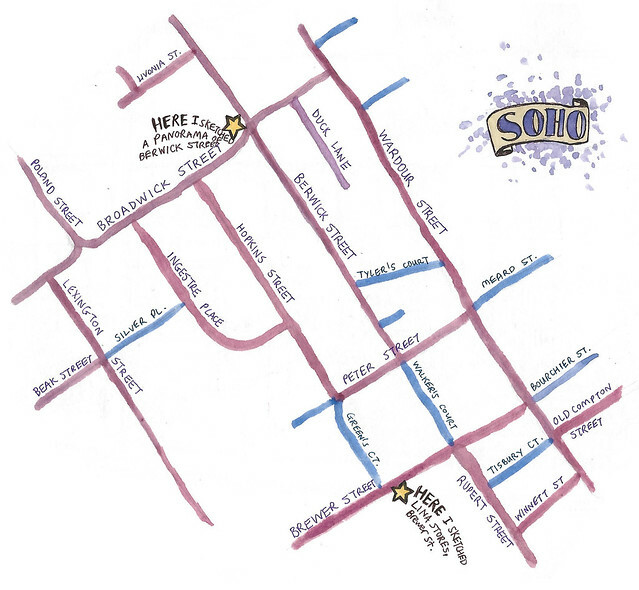 Do you know why it’s called Soho? I used to tell people it’s because it is “South of Hoxford Street”, and some people even believed it, but in fact the name comes from an old hunting cry (“So-ho!”, like “Tally-Ho!”). This area in fact used to be a hunting ground in years gone by (yes, yes in some ways it still is, ha ha, very funny). 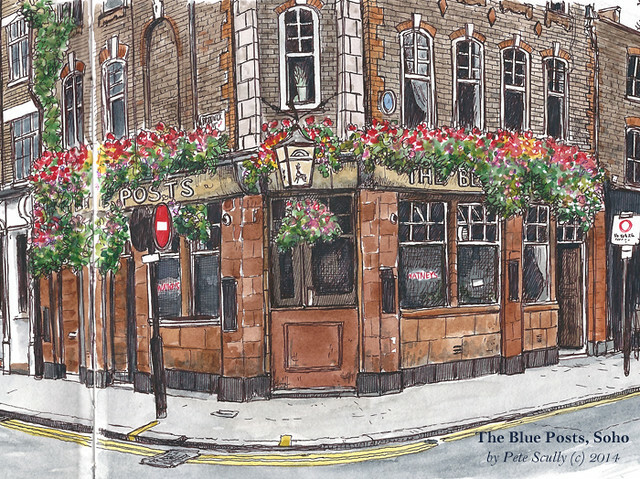 Now, the hunting ground would be bordered by posts which were painted blue, and that is why there are two pubs in Soho called the Blue Posts, one of which is in the middle of the panorama above. Here’s a close-up, below. 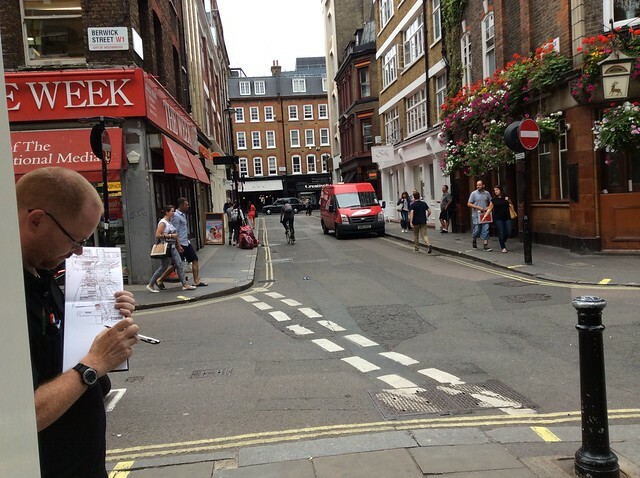 Here I am sketching, in a photo taken by Random Passing Chinese Tourist. And below, the sketchbook-selfie (really? That’s what it’s called?) showing what I was able to do on site. Two and a half hours of penwork. I added all the watercolour when I got home. Around the corner, the Soho staple art store Cowling and Wilcox now stands empty, closed after fifty years, though they are still open in other locations. A representative from Cass Arts around the corner was stood outside handing leaflets to people directing them there instead, but I told him I didn’t need one (I had just been to Cass). He didn’t take that for an answer and told me to take the leaflet. No thanks mate, I don’t need one. “Take it anyway,” he insisted. No, I don’t need one. “Take it and throw it away then,” he kept on. I don’t want a leaflet, mate, will you leave me alone. He wouldn’t. “You’d be doing me a favour by taking the leaflet.” He was quite pushy. No mate, please leave me alone. He glared for a while incredulous at the idea that I wouldn’t take a leaflet telling me where a store is that I have just been to but then left it and started bothering other people. That’s Soho for you, but there are sometimes pushier sales-folk on these streets, if you know what I mean. 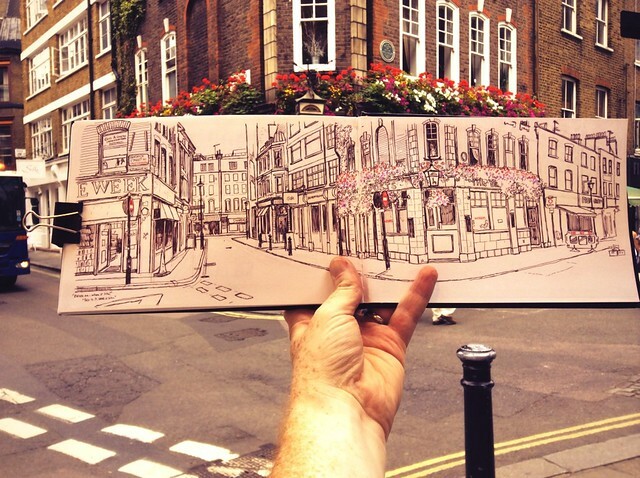 By the way, there is another sketch I did in Soho that afternoon, around the corner on Brewer Street. 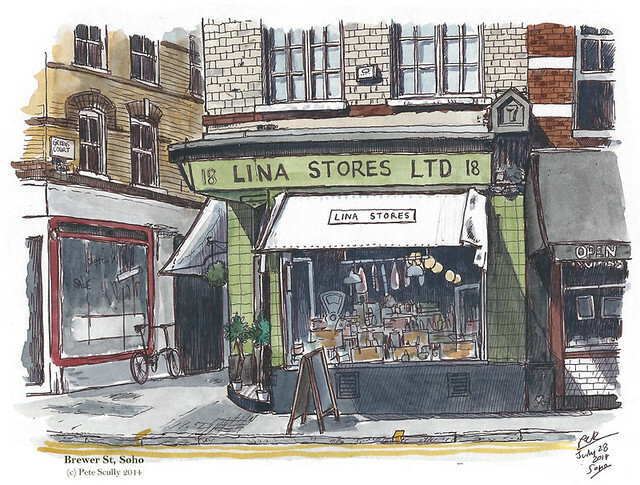 It’s a cool looking shop called Lina Stores Ltd on the corner of Green’s Court, and I just had to sketch it. And that was the end of my first day back in London! 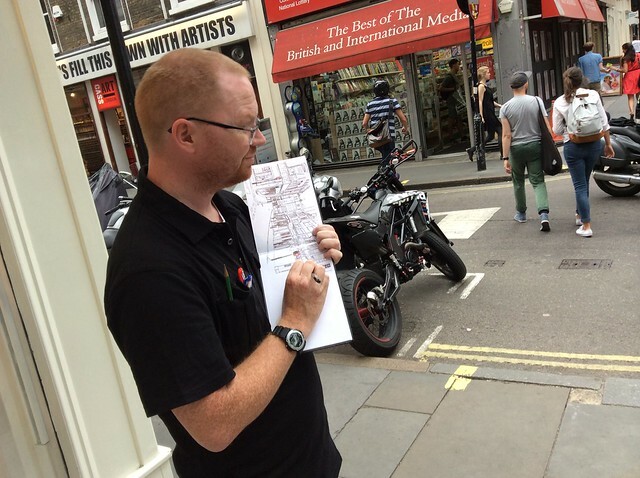 Here’s a map of Soho showing where these two were sketched. IT doesn’t show the previous two from earlier in the day but well, you can figure them out. Cheers Myra! 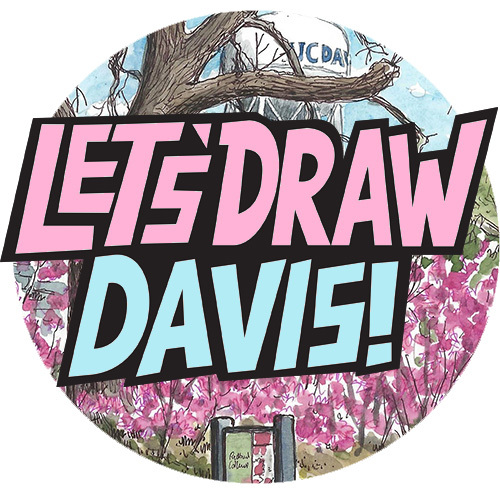 I did draw St. Paul’s, as well as about seven other Wren buildings on my sketchcrawl. They’ll be up soon.